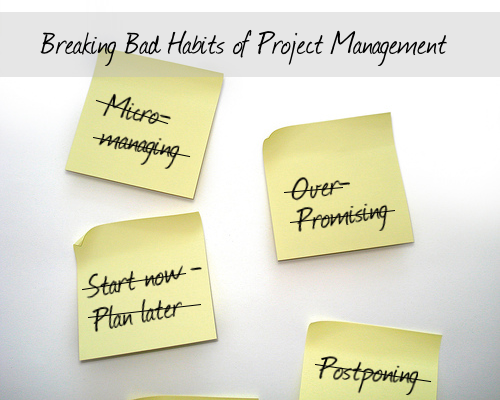 It's an easy habit to get into with all the features of modern project management software. I can schedule a meeting for every third Wednesday not falling on the 13th for the next millennia with software. I can see what every employee is doing every minute of every day they're in the office. But I shouldn't. I'm as guilty of this as anyone, but I have to remind myself to spend as much time conversing with my team as I do supervising them. This isn't an attempt at touchy-feely management, though it has its place, but is rather the best way I've found to keep everyone on task, motivated, and communicating. I'm much more likely to hear about a passing concern that I might be able to solve correctly by speaking with employees than I am by monitoring their work and hoping they email. Back away from the software, step away from your desk, and manage your projects effectively. I put this bad habit after depending too heavily on software because it's the opposite extreme. You have hired smart, capable people. If you haven't, start. You need people you can depend on, and assuming they're working for you, you need to give them the freedom to work well. This can mean leaving them to their own (supervised) devices. The only thing that makes me happier than a plan coming together is a plan coming apart and working even better than I'd imagined. This doesn't happen with constant micromanagement. Ingenuity is only possible with freedom, so give your smart, capable team the opportunity to show you why they were hired in the first place. Different than depending too heavily on software, staying at 30,000 feet has a similar effect. If you've been around the corporate world for any length of time, you've heard the phrase "from the 30,000 foot level" meaning when we look at the problem within its larger context. Doing this is the job of any project manager, but it is equally important that they get down on the ground and see what's causing any 30,000 foot issues. Not doing so not only guarantees you'll miss some small issues that might cause small problems, but furthermore that you'll miss those smaller issues that inevitably snowball into much larger ones. This is often the direct result of the bad habit of staying at the 30,000 foot level. It's fairly easy for someone seasoned in project management to identify problems. Missed deadlines, small tasks taking longer than their allotted range, software inefficiencies, they're all easily identifiable once you've been doing this long enough. The problem, however, occurs when you spend your day putting out these small fires rather than discovering what's causing them. It's an easy bad habit to get into. When you're in the thick of it, spending 5 minutes of every hour fixing minor symptoms of a larger disease can be tempting. It can even distract you from the fact that there's a disease in the first place. Of course, there is a disease, and you'll never cure it by treating only its symptoms. You have to get out from behind the project management software and take on the challenge of solving root issues. It's your job, and by doing so you're giving your team the best opportunity to succeed, which is your responsibility to your team. Hopefully you do your job so well that there are some processes that essentially run themselves. Maybe it's your onboarding process. A new client signs, management is made aware, the project is handed to a project administrator who delegates appropriately, and the work gets started. It's a beautiful thing. The best professionals, however, refuse to accept the status quo. Perfecting a process does not mean that you never have to revisit it. Improvement is never-ending, and therefore the perfection of a process does not allow for complacency, but rather gives you the opportunity to try and increase efficiency, quality, or value, without risking the product. Don't get comfortable, get better. This is probably one of the only project management bad habits in this piece that has to do primarily with personality and isn't something that's just easy to slip into due to human nature. Spend long enough in any job and you will have failures. If you're in project management, it is your responsibility to your team to take the blame for those failures. Does this mean you never get the opportunity to address single points of failure within your team? No. But if I ever hear that the failure of a project was due to a single person's failure, my instant reaction is not to call in the person causing the issue, but to ask why the manager of that team allowed that person to have such an effect. If they're inadequate, what have you done to address the issue? If you've done everything you can, why is that person still working here? If you haven't done anything to address the issue, I may start asking myself the same question about you. It sounds harsh, but not addressing inadequate personnel only drags down your adequate people. Breaking bad habits may not be easy, but it is the only way to ensure you're holding up your end of the bargain to your team. If you want dedicated, creative, hard-working people, show your team what it looks like every day. Breaking Bad Habits - InLoox • Copyright 1999-2019 © InLoox, Inc. All rights reserved.